A three-year-old girl has suffered a life-threatening head injury in a crash which left her mother seriously hurt. The pair, from Shaftesbury, Dorset, were flown to hospital by air ambulance after their car was in collision with a van on the A354 at Thickthorn Cross near Blandford. A 44-year-old Salisbury woman, who was driving a Ford Transit van, was also seriously injured in the crash at about 07:52 BST on Thursday. The road was closed for seven hours. 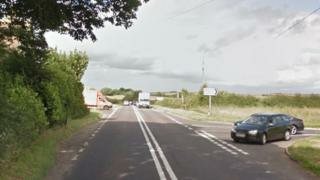 Dorset Police said the 34-year-old mother, who was driving a silver Vauxhall Astra, sustained a serious head injury. Sgt Phil Lee said investigators wanted to trace a silver Volkswagen Passat estate which used the junction immediately before the collision. The crash blocked traffic heading for the opening day of the Great Dorset Steam Fair at Tarrant Hinton.